For the past decade, there was a so-so coffee shop in the Santa Monica Fred Segal--I know this, because I used to get my coffee there when I worked next door. I am intensely grateful that Umami Santa Monica was not open at that location back in 2000-2001, or I would be fantastically and magnificently obese. I mean assisted living, getting around on a scooter, needs help to pee, weighing in on a special scale, extra wide doors, reality show obese. Umami Santa Monica was the second Umami Burger location that we have reviewed, and it was as good as the original Umami Burger on La Brea. The burger reviewed and pictured was the usual...bun, meat, and cheese. 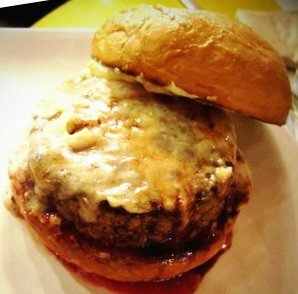 Umami Burger's menu offered a variety of interesting topping combinations, but we are not in the habit of reviewing toppings. The Beef: The various and flavorful beef cuts (short rib, flap, skirt, and brisket) were clearly well-marbled prior to being ground into the medium coarse blend that became burger patties. The burger had a luxurious mouth feel from the fats and juices. The patty was precisely and evenly formed yet loosely packed. This created uniformity and avoided chewiness while allowing the texture of the various cuts to come through. The blend also retained a nice volume of juices, which later soaked into the bun. Fat Bruce Lee declared this to be a "fantastic burger." The Sear: Ta da!! The sear was completely even and dark. This was accomplished with top heat, lots of it, from a mighty broiler rather than the bottom heat of a griddle. The Preparation: Med-Rare as ordered. The beef was handled with great care. The amazing tenderness and perfectly even temperature was due to a sous vide treatment of the burger patty prior to searing it off on the flat top. The Seasoning: Yeah--just right. The burger patty was thoroughly seasoned on the exterior. The patty was thin enough not to require seasoning throughout the blend. Still, they clearly tricked out the blend with some extra umami ingredients, which made the cheeseburger's flavors really come together. The Cheese: I went with the American cheese that Umami Burger made in-house. It was pretty fantastic. It melted perfectly and evenly. The flavors were creamy, sharp, mellow, and salty. 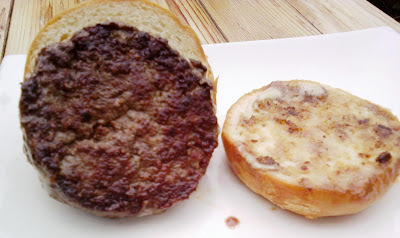 The Bun: The burger came on an evenly toasted, non-seeded, pillowy, domed, white, hamburger bun. I was pleased to see that they didn't oil the bun as they had on previous visits--I was never a fan of grabbing an oily bun. The bun had that "school lunch roll" sweetness with the yielding firmness of a potato roll. Meat to Bun Ratio: This was just right. 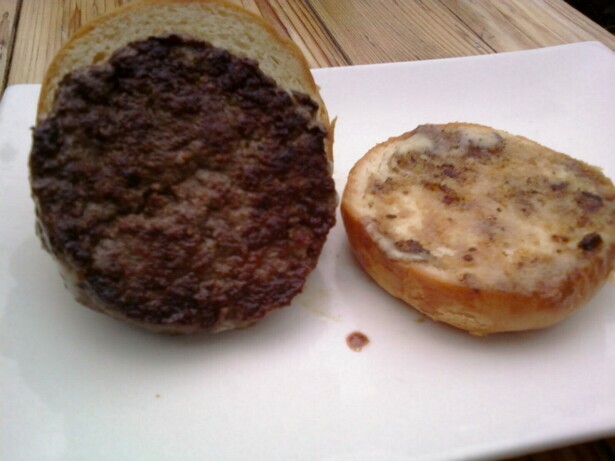 The precise meat to bun ratio provided a last bite, which was identical to the first bite. The Fries and Tots: The skinny fries were as good as McDonalds made them back when they cooked their fries in beef tallow, and they were seasoned perfectly. The Tots were more like cylinders of minced, au gratin potatoes with Cheddar, which were breaded in panko and then fried to a crisp golden brown and salted perfectly. Both starch choices were fantastic. Burger Review : The themes that ran through Umami Santa Monica were consistency and precision. They truly shamed almost every other burger that we have tried in Los Angeles by executing everything perfectly. This was case of quality ingredients prepared with great care. 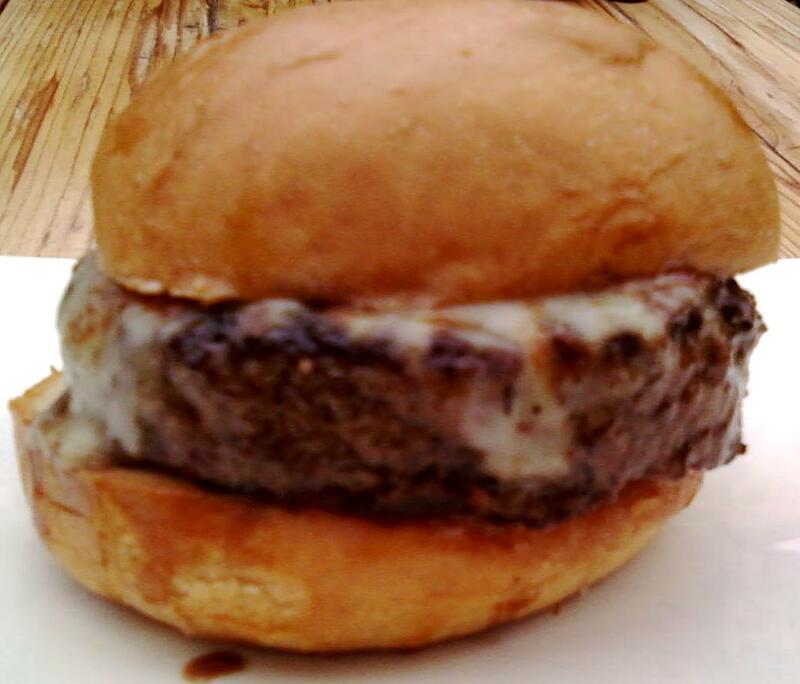 If you have not tried Umami Burger, do it soon, because you NEED to try the best burger in Los Angeles. Simply the best burger I've had in LA, and close to the top of the list of Burger Club LA rankings. Glad to see you guys thought the same. And also fun to see others around town who are searching for the best burger in LA. Constructive criticism: I'm not sure I agree with your methodology of going to a place and asking the chef to take off all the toppings from his burger... While it may be fun to review that way (and from your description, makes me feel less manly for allowing vegetables to top my meat), I don't think it provides any benefit to the people who are going to order off the menu and in most cases experience a completely different taste. Just a thought... Feel free to let me know how passionately you disagree..
Look forward to reading more from this site. Keep 'em coming! Nice! What are your other favorites? I much prefer reviewing good ones over bad ones. I won't passionately disagree with you, because your point is valid. The reason that we take a simple approach to reviewing burgers is strictly pragmatic. I needed a simple way to limit the number of variables. It's not for everyone, but it works for us. Honestly, about 11 years ago, this all started out as a quest for the best steak in the country, but I quickly found that steaks weren't nuanced enough to sustain ridiculous quest. However, burgers add enough variables (cuts, grind, handling, bun, etc.) to create a pretty massive number of permutations. Adding toppings to the mix would have added orders of magnitude to this and would have made head-to-head comparisons very difficult--this was as close to objective, in terms of methodology, that I could achieve. I do think that the condiments/toppings, if used as such, simply serve to enhance the goodness, or hide the badness, of the base ingredients. Just the tip. Well said. Are you a prof? Thanks--I am a scientist turned chef, but now I am just a humble lover of burgers. Umami is disgusting. How much PR dollars are they paying you guys? You will note that Umami Burger earned a negative review for those burgers. You should also take note that this was the most recent thing that was posted about them here. You should be able to deduce for yourself that zero PR dollars have come from Umami Burger. I don't understand how you can give Umami a 5. Umami is mediocre at best and far from the second best burger in LA. I just lost a lot of respect for this burger blog. It was great on that particular day. If you keep poking around on this site, you will notice that I gave them a scathing review for delivering 2 inedible burgers. I've had many great burgers at Umami and several ones that were very very average. I think it varies by location and luck of the draw, they aren't ran by a management group that cares about service or consistency - they are ran by SBE which is just interested in financial gain and growth. But I can definitely see how they can get a 5 and a 2. Consistency is key - if they took a note from Houston's (Hillstone Group) then I could see going to Umami regularly. As it stands it serves as a good take-out option (yeah I can't stand going in and eating there. Kind of annoying atmosphere and people if you ask me). I just had Umami in San Francisco last night. Pretty good burger. Do check out Super Duper Burger...1/2 the price and just plain better. The shakes are crazy good, too. 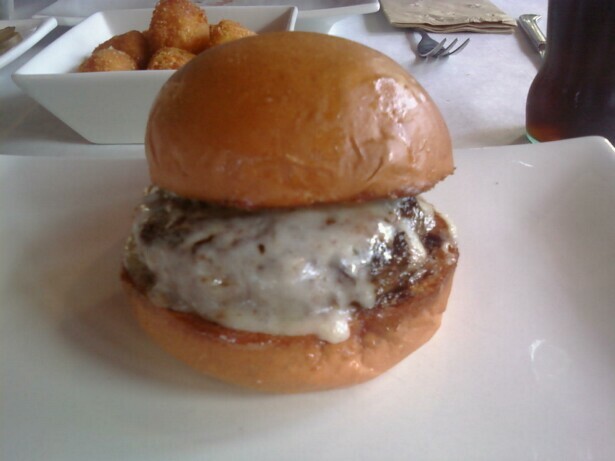 Had my first Umami burger last night at the Grove. In a word - Dreadful! Hillstone Group makes the best burgers in LA - possibly the world. Fries, both sweet and regular, are also far superior at any Hillstone establushment. And the Kale Salad is superb. Will neverr revisit Umami! The wheels have fallen off at Umami Burger over the past few years. It is sad, because when it was at its peak, it was amazing. Shouldn't you update this list since your review of Plan check you said it was better than Unami.